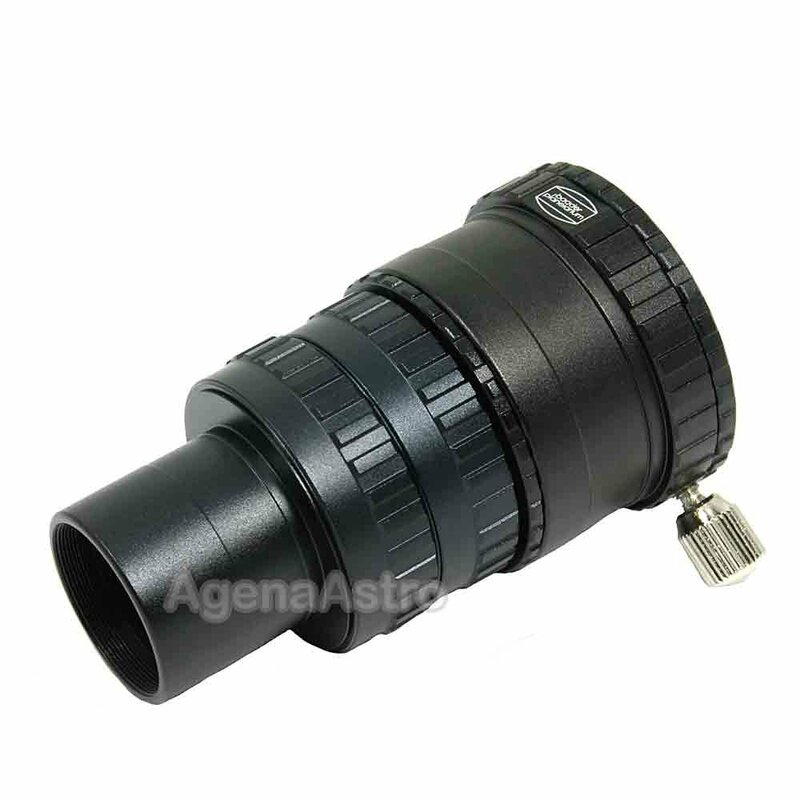 Designed to accept 1.25" eyepieces and fit 1.25" focusers, it also incorporates a 2" section for use in 2" focusers. The eyepiece holder uses dual nickel plated clamp screws for maximum convenience and security, and incorporates a captive spring bronze lock ring to prevent any possibility of damage to your eyepieces. As with all Baader Planetarium products, the quality of machining and detail of design is unsurpassed. The internal surfaces are all fully sharp V-threaded and blackened to eliminate stray light reflections. Surfaces are finely machined and satin anodized for function and appearance, and the pieces all fit closely and precisely. The heart of the VIP modular barlow is its precision air-spaced negative lens assembly. The large 24mm clear diameter of the optics minimizes vignetting, and its apochromatic field-flattening design makes it well suited for high power planetary observing as well as for CCD cameras. Both lens elements are polished to a very high standard, and fully multi-coated, using the finest 7 layer multi-coatings available today (reflections per surface are less than 0.2%!). The result is a sharp, high-contrast image that is virtually unaffected by its passage through the barlow. - One of the distinguishing features of the VIP Modular Barlow is its construction from multiple interchangeable parts. The structural building blocks of the barlow interconnect using standard T-2 (42mm) threading, enabling you to easily configure the system for multiple uses. - The nominal multiplication factor of the barlow is 2X, based on a 68mm distance from the barlow lens (flange top surface) to eyepiece field stop or film focal plane. As supplied, the VIP barlow provides this nominal distance at the top surface of the eyepiece holder (#15). - The VIP barlow accepts both 1" and 2" filters, giving you the maximum flexibility to incorporate filtration for visual or photographic use. The T-2/1" nosepiece barrel is threaded for standard 1" filters, and the 2"/1" reducer (#15) is threaded to accept 2" filters (see the schematic for details). Please note: we have found variations amongst threading used by filter manufacturers, and filter fittup may vary depending on filter manufacturer (we have found some Lumicon and older University filters that fit snugly, or fully thread on but continue to spin even though fully and safely seated due to short threads and large thread reliefs ). - As shown in the VIP Modular Barlow Schematic, the barlow can be combined directly with our Amici Star Diagonal, giving you a neatly integrated 2X package. Simply thread the barlow lens cell (#4C) into the top of the diagonal, and attach the remainder of the barlow body pieces to the star diagonal as shown. If needed, the T-2/1" nosepiece (#14) can be used as the star diagonal's nosepiece. - The VIP Modular Barlow makes an ideal companion to CCD cameras. Its large clear diameter will illuminate even the largest CCD detectors, and its apochromatic field flattening design will maintain the image quality of your primary optics. The modularity of the VIP barlow system makes it easy to position the lens at the correct distance for a 2X amplification factor. For example, with an SBIG ST7/8/9/10 series camera, the distance from the detector to front T-threaded mounting surface is 0.920" (23.4mm) (data from SBIG). In order to set the nominal 2X distance (68mm), you would use a total of three 15mm extension tubes (#25A) in between the 1.25" nosepiece (#14 on the schematic) and CCD camera (i.e. you would need to acquire one additional 15mm extension tube, since two are already included as part of the VIP Barlow). Or, you could include a T-2 Changer System in place of one of the 15mm extension tubes (the changer is also 15mm thick), and permit rapid removal and replacement of the camera or parfocal focusing eyepiece. - As shown in the VIP Modular Barlow Schematic, in order to use the barlow as a 2X photographic amplifier, you simply uncouple the barlow at the first 15mm extension tube (#25A-1) and attach the barlow to your 35mm camera's T-ring. This will result in the proper spacing for a 2X factor.